In New England, there is only one kind of Clam Chowder – and it’s creamy. If you are looking for a tomato-based fish soup, we recommend Caldeirada. This is a delicious gfcf, gluten free, family-friendly recipe! It is also (if you double check ingredients!) a wheat free, dairy free, soy free, egg free, tree nut free, peanut free, and fish free recipe. I live in Massachusetts, and grew up with clam chowder. After spending 5 years on the coast, finding clams at the beach, I’ve been trying to make a delicious dairy-free clam chowdah. This hits the spot! Add everything to the crock pot. Cook on low for 6-8 hours. Taste about an hour before serving (if possible) and adjust seasoning. This was so good, I ended up eating 3rds, and one of my daughters cried when the leftovers were gone. When served as a main course, this recipe will feed 4-6 people, usually with leftovers. This is a great meal when served with focaccia and a salad. It can also be served as a starter course, and would be a delightful addition to any fish dinner! My whole family loves fried calamari, but I don’t like the work required to make it. Occasionally we’ll go to a restaurant that sells gluten-free fried calamari as a treat for my oldest daughter (fried calamari and sushi are her two favorite foods), but we were looking for an easier cooking method for in-between restaurant trips. Our local grocery store sells frozen calamari tubes which are pre-cleaned and easy to just slice into rings. I found that if the calamari is mostly thawed rather than fully thawed, it’s easier to slice. This is a light “sauce” for pasta, and could be paired with a salad, artichokes, or any roasted vegetable. We had roasted brussels sprouts on the side, one of our favorites. This is a delicious gfcf, gluten free, family-friendly recipe! It is also (if you double check ingredients!) a wheat free, dairy free, soy free, egg free, tree nut free, peanut free, and corn free recipe. Thaw the calamari: submerge the frozen package in cold water, then place under a slooowly dripping faucet for 20-30 minutes. While the calamari is thawing, bring the salted water for cooking the pasta to a boil. Cook pasta according to package directions. When the calamari is mostly thawed, cut the tubes into rings (cutting the flattened tubes into strips, which creates rings when the tube is opened). Don’t slice the tentacles, they’re great as-is. Set the calamari to the side. In a large skillet, mix olive oil and margarine, and heat to medium, melting the margarine. Add onion and garlic to the oil, and begin to sauté. Add spices, and keep the garlic & onion moving so it doesn’t brown or burn, cooking for about 3-5 minutes. Add a splash of white wine if desired, it will carry the flavors, but the alcohol is burned off. 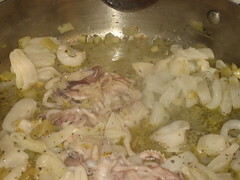 Add the calamari rings and tentacles to the garlicky goodness, and cook for about 6 minutes. The calamari will be cooked, but not rubbery. Take calamari off heat before it gets rubbery!!! 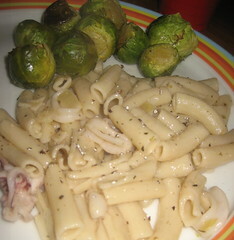 Drain the pasta and toss with the calamari, then serve with a salad, roasted brussels sprouts, or another vegetable. Delicious, easy, and ready in under 45 minutes! When I was mostly vegetarian with the exception of some occasional shrimp/lobster/crawdads when we ate out, I loved to order shrimp alfredo or crawdad alfredo. Mmmmm…. Well, eating out is trickier now, so I figured out a way to make something that tasted a lot like what I loved in the restaurants. If you don’t want a bit of kick, leave out the Tony Chachere’s, but my favorite alfredos were always from the Cajun restaurants! Peel and de-tail the shrimp. If you buy de-veined large shrimp, it’s a reasonably quick process, just tedious. Remember the trick for frozen shrimp – to thaw them quickly, put them in a bowl with cool water running over them – should be cold, but ready to peel in about 30 minutes. Prepare the pot for boiling water for the pasta (make sure to salt the water! ), and put it on a back burner on high. When it boils, cook the pasta according to package instructions. Tinkyada pasta takes a while to cook (15 minutes), so keep your pastas cooking time in mind when you’re preparing the rest of the meal. While the water is getting ready to boil, make the White Sauce. Next, pour some oil in a large skillet, and bring it to medium heat. Sauté the garlic until it’s tender. When the pasta only has a few minutes left, add the shrimp, and sprinkle with the Tony Chachere’s. I use tongs to move the shrimp around the skillet quickly and easily. As soon as all of the shrimp are pink, add peas and take it off the heat. Add white sauce to the shrimp, and mix together. Drain the pasta, and pour it into a pretty serving dish (or back into the pot), and then gently mix in the sauce, shrimp, and peas. Serve with a nice salad, and enjoy! Preheat oven to 350. Oil a glass baking dish. Put the fish in (1 layer). Spoon salsa on top of the fish. Bake for 10 min, check for doneness. Bake until fish flakes off. We served with a steamed or roasted vegetable and salad. 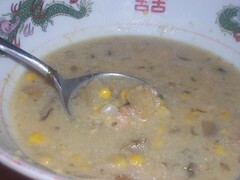 Caldeirada is a meal in itself. The ingredients depend on the catch of the day. Putting the fish on top, preserves their integrity. And this was looooved by everyone in our house! 1 (14 oz) can crushed tomatoes, or the half of a 28oz can you have left over. Cut the pepper into thin strips. In a large oven-to-table pot, heat the remaining oil and stir in the pepper strips, garlic, and onions. Add the potatoes and sprinkle with a little salt. Add the chopped tomatoes, bay leaf, crushed red pepper, 2 tablespoons of cilantro, peas, and 1 cup of water. Cover and bring to the simmering point. Cook for 20 minutes. While it cooks, rinse the mussels/clams and cut the fish into 2-inch pieces. Place the clams/mussels around the perimeter of the dish and put the pieces of swprdfish in the center. Place the whitefish on top, pour the wine over the fish, and sprinkle with a little pepper and the remaining cilantro. Finally, place the pepper circles in the middle, cover again, and cook for 10 more minutes, or until the clams have opened and the fish is cooked through. Take to the table and serve, making sure each person gets a variety of fish. Serves 6, or 4 with yummy leftovers. This is a delicious gfcf, gluten free, family-friendly recipe! It is also (if you double check ingredients!) a wheat free, dairy free, soy free, egg free, tree nut free, peanut free, and South Beach phase 2 safe recipe. Place fish in baking dish oiled with a little olive oil. Cover fish with tomatoes, capers, olives, peppers, etc and splash with a little basil, balsamic vinegar, and Kosher salt. Bake for 10-20 minutes. Check for doneness. Fish will flake when done. Cooking time will depend on thickness of fish. YUM. 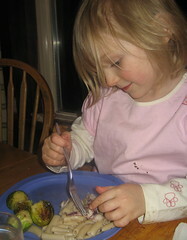 The children wanted their “stuff” scraped off, but ate the fish happily with balsamic vinagrette on top.